river, c.130 mi (210 km) long, rising in the Rocky Mts., NW Mont., and flowing generally E to the Missouri River at Great Falls. The Sun River project of the U.S. Bureau of Reclamation utilizes the Sun and its tributaries to irrigate c.92,000 acres (37,230 hectares) of land. Of the system of dams and reservoirs, Gibson Dam is one of the project's largest. ..... Click the link for more information. . Its gravitational attraction maintains the planets, comets, and other bodies of the solar system in their orbits. ..... Click the link for more information. (AU) of distance used for measuring distances within the solar system. The sun is approximately 865,400 mi (1,392,000 km) in diameter, and its volume is about 1,300,000 times that of the earth. Its mass is almost 700 times the total mass of all the bodies in the solar system and 332,000 times that of the earth. The sun's surface gravity is almost 28 times that of the earth; i.e., a body on the surface of the sun would weigh about 28 times its weight on earth. The density of the material composing the sun is about one fourth that of the earth; compared with water, the sun's average density is 1.41. At its center, the sun has a density of over 100 times that of water, a temperature of 10 to 20 million degrees Celsius, and a pressure of over 1 billion atmospheres. luminous envelope surrounding the sun, outside the chromosphere. Its density is less than one billionth that of the earth's atmosphere. The corona is visible only at the time of totality during a total eclipse of the sun. ..... Click the link for more information. ). H. A. Bethe proposed a cycle of nuclear reactions known as the carbon cycle, or CNO bi-cycle, to account for the nuclear changes. In this cycle carbon acts much as a catalyst, while hydrogen is transformed by a series of reactions into helium and large amounts of high-energy gamma radiation are released. It is now thought that the so-called proton-proton process is a more important energy source; this process begins with the collision of two protons and ends with the production of helium, while gamma radiation is released throughout. ..... Click the link for more information. . These were first intensively studied by Joseph Fraunhofer and are commonly known by his name. From a study of the lines the chemical composition of the sun is determined on the basis of the discovery by Kirchhoff that the dark lines correspond in position to the bright lines characteristic of the spectra produced by elements in the laboratory. The darkness of the lines in the sun's spectrum is attributed to the presence of a slightly cooler layer of gases above the photosphere, known as the reversing layer, which absorbs selectively the light of the photosphere and thus causes dark lines instead of bright ones to be observed through the spectroscope. By comparison of the sun's spectrum with laboratory spectra of incandescent elements, most of the elements known on earth have been identified in the sun's atmosphere. , device invented by the French astronomer B. Lyot (1931) for the purpose of observing the corona of the sun and solar prominences occurring in the chromosphere. device for photographing the surface of the sun in a single wavelength of light, usually one corresponding to a chief element contained in the sun, e.g., hydrogen or calcium; the resulting photograph is called a spectroheliogram. ..... Click the link for more information. , e.g., faculae, plages (flocculi), prominences, flares, and coronal mass ejections (eruptions of charged particles into space). Without the heat and light of the sun, life as we know it could not exist on the earth. Since solar energy is used by green plants in the process of photosynthesis, the sun is the ultimate source of the energy stored both in food and fossil fuels. Solar heating sets up convection currents, and thus is the source of the energy of moving air. Falling rain also owes its energy to the sun because of the relation of solar radiation to the water cycle. See K. Hufbauer, Exploring the Sun: Solar Science since Galileo (1993); R. Krippenhahn, Discovering the Secrets of the Sun (1994); K. J. H. Phillips, Guide to the Sun (1995); P. O. Taylor, Beginners Guide to the Sun (1996); S. T. Suess and B. T. Tsurutani, ed., From the Sun: Auroras, Magnetic Storms, Solar Flares, Cosmic Rays (1998). The central body of the Solar System and nearest star to Earth, situated at an average distance of 149 600 000 km. A main-sequence star of spectral type G2 V, mass 1.9891 × 1030 kg, diameter 1 392 000 km, luminosity 3.83 × 1026 watts, and absolute visual magnitude +4.8, the Sun is a representative yellow dwarf. It is the only star whose surface and outer layers can be examined in detail. The Sun is composed predominantly of hydrogen and helium (about 70% by mass hydrogen, 28% by mass helium), with about 2% of heavy elements. It generates its energy by nuclear fusion processes, the most important of which is the proton-proton chain reaction, and is losing mass as a result, at a rate of about 4 000 000 tonnes per second. The generation of energy takes place in a central core, which has a temperature of around 15 000 000 K, is about 400 000 km in diameter and contains about 60% of the Sun's mass (in barely 2% of its volume). Outside the core is the radiative zone, an envelope of unevolved material through which energy from the core is transported by successive absorption and emission of radiation in collisions between the atomic particles (see energy transport). The individual particles proceed outward in a ‘random walk’, in which their direction of travel and energy change with each collision. It has been estimated that it may take as long as 20 million years for the energy generated in the core to reach the surface. The radiative zone extends to within about 200 000 km of the surface, where, the temperature having fallen to around 1 000 000 K, convection becomes the more important mode of energy transport (see convective zone). The surface of the Sun, or photosphere, represents the boundary between the opaque convective zone and the transparent solar atmosphere. It is a stratum several hundred kilometers thick, from which almost all the energy emitted by the Sun is radiated into space. A permanent feature of the photosphere is the granulation, which gives it a mottled appearance. More striking are the sunspots and their associated faculae, the numbers of which fluctuate over an average period of approximately 11 years – the so-called sunspot cycle. Observation of the transit of sunspots across the Sun's disk discloses a differential rotation, the synodic period of which increases with heliographic latitude from 26.87 days at the equator to 29.65 days at ±40° (beyond which sunspots are seldom seen). The mean synodic period is taken to be 27.2753 days, which is equivalent to a sidereal period of approximately 25.38 days (and corresponds to the actual period at around ±15° latitude). Spectroscopic measurements show that the rotation period continues to increase right up to the polar regions and that at any given latitude it decreases with height above the photosphere, except at the equator where the periods are approximately equal. The reason for this differential rotation is unknown, although it has been suggested that it may be caused by rapid rotation of the Sun's core. From the base to the top of the photosphere the temperature falls from about 6000 K to about 4000 K.
Immediately above the photosphere is the chromosphere, a stratum a few thousand kilometers thick, in which the temperature rises from about 4000 K to around 50 000 K as the density decreases exponentially with height. Between this and the exceedingly rarified corona is the transition region, a stratum several hundred kilometers thick, in which the temperature rises further to around 500 000 K. The corona itself attains a temperature of around 2 000 000 K at a height of about 75 000 km. It extends for many million kilometers into the interplanetary medium, where the solar wind carries a stream of atomic particles to the depths of the Solar System. The Sun is thought to possess a weak general magnetic field, although this has yet to be distinguished from the transient polar fields resulting from the dispersal of the intense localized fields of sunspots (see sunspot cycle). The age of the Sun is at least 4.6 billion (109) years and it may be regarded as a middle-aged star. After a similar period it is expected to expand to a red giant and then to collapse to a white dwarf (see stellar evolution). See also active Sun; neutrino astronomy; quiet Sun; solar activity. 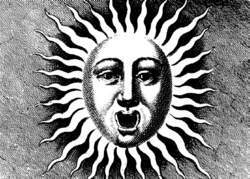 A seventeenth-century engraving of the Sun. Reproduced by permission of Fortean Picture Library. The Sun is the star around which Earth and the rest of the planets in the solar system orbit. The earth orbits the sun at an average distance of 93 million miles and takes 365.26 days to complete a revolution—known as a sidereal year. The plane upon which the Earth travels around the Sun is called the ecliptic. From the perspective of the Earth, it appears as if the Sun is revolving around the Earth against a particular band of background stars. This band of 12 constellations is known as the Zodiac. The moon and all the planets orbit within the confines of this 18-degree-wide band, with the Sun apparently traveling on the ecliptic, its center. Therefore the latitude of the Sun is always zero. Although the Sun never appears to retrograde in the sky as the other planets do, it does appear to slow down in speed as the Earth distances itself from it in its annual orbit. This occurs during the northern hemisphere’s summer months when the Sun’s apparent speed falls under its mean 59 minutes and 8 seconds per day. Astrologically, it rules the sign of Leo where it is most comfortable and is exalted in the sign of Aries where the Babylonians considered it to be held in special esteem. The Mesopotamian civilizations were some of the earliest to systematically observe the movements of the Sun and planets in the sky. Because of the difficulty in locating the sun against the map of the stars during the day, the Babylonians had two methods by which they inferred its position in the zodiac. In the first method they noted the phase of the Moon and its zodiacal position and from that inferred where the Sun was located in the sky. Therefore, if the Moon were in its waxing quarter phase and located in the sign of Virgo, one could deduce that the Sun was somewhere in the sign of Gemini. In the other method, the Babylonians located the Sun by observing the constellations rising and setting just before and after the Sun, when its light was dim enough to be able to observe the star map. This second method was also popular amongst the Egyptians who used a solar calendar and had mapped the sky into constellations. In contrast, the lunar Babylonian calendar allowed them to discover that 19 solar years were roughly equal in length to 235 lunar months. This is known as the Metonic cycle, whose 19-year solar period is important in the timing of events in Hellenistic astrology. In Sumerian the Sun was known as Utu and in Akkadian as Shamash, the names of the two solar deities of Mesopotamia. However, according to Nick Campion, the two words could mean either the visible planet or the hidden power within it, i.e. the god. Campion argues that the Sumerians considered the planets and stars to be under the power or authority of specific deities, but that they were not understood as the planet itself. This is one of the reasons why the sun-god is not the most central figure in the Mesopotamian mythologies nor of that of the Greeks who mapped much of their Pantheon onto the sky religion of the Babylonians. Another related explanation, as Robert Powell points out, is that the Babylonians noted that none of the planets were always visible in the sky, therefore no single deity could have supreme authority. Instead they governed through a council made up of all seven gods. During the Babylonian history, Marduk (the deity associated with the planet Jupiter) established himself as the president of the Council, but the Moon god, Sin, had also been known as “lord of the gods” in a time before the rulership of Marduk. Similarly during the Old Babylonian period of the Amorite king Hammurabi (1792–1750 b.c.e. ), the sun god Shamash was considered the “king of the gods.” In fact “Hammu” was the old Semitic name for the sun-god and thus, according to Powell, points to the worship of the solar deity. Shamash was the son of Sin (a male lunar deity) and brother of Ishtar (associated with the planet Venus). He was the great benefactor to humanity because he ignited and supported the growth of life through his light and warmth. However, the early civilizations of the arid Mediterranean and Middle East, were all too aware of the Sun’s scorching rays and his ability to burn up crops and dry up rivers and lakes. In Hellenistic and Hindu astrology this translated into a negative influence of the Sun when it was positioned too close to one of the other planets. The planet was designated as “combust” (within 8° from the Sun) or “under the Sun’s beams” (within 17°) and was either interpreted as being hidden or operating in secrecy (out of sight), according to Hellenistic astrology, or as weak and ineffective in the Jyotish tradition. This concept of light translating into a higher degree of “sight” finds an echo in the Greek sun-god Helios who was also the god of seeing and often invoked to heal blindness. Medieval astrology, which was largely an Arabic evolution of the Hellenistic tradition, regarded combustion as especially detrimental. Guido Bonatti (thirteenth century) says: “A corporal conjunction with the Sun is the greatest misfortune that can befall a planet.” To William Lilly, the Sun is associated with eyesight, cataracts, eye diseases and the brain—and an echo of this can be found in Vedic astrology. One of the more notable characteristics of the Babylonian sun-god was that he was the arbiter of justice, a role associated with Jupiter in modern astrology. Powell explains this perspective in terms of the interpretation of the Sun’s regularity as “infallibility,” a desirable trait in the arbitration of justice. In Jacobsen, it is Utu’s ability to “enlighten” or to have “clarity of vision” which is considered when he says Utu is the “power in light, the foe of darkness. On the social place he therefore becomes a power for justice and equality …. He is therefore the judge of god and men, presiding in the morning in courts such as the one we know from the Bathhouse Ritual, where demons and other evil doers are sued by their human victims. At night he judges disputes among the dead of the netherworld. He is the last appeal of the wronged who can obtain no justice from their fellow men, and their cry of despair to him, ‘i-Utu!’ was feared as possessing supernatural power” (as noted in Nick Campion’s Cosmos: A Cultural History of Astrology. Conversely, Hellenistic astrologers also noticed that the Sun’s close rays could hide other planets and keep them from exerting their powers in an obvious way. This dual nature of the Sun is described in Ariel Guttman and Kenneth Johnson’s Mythic Astrology in terms of the Greek myth involving the other solar deity, Apollo. While Helios personified the physical Sun, driving his chariot across the sky and ordering the days and the seasons, Apollo represented the Soul of the Sun. After Apollo was born of Leto and Zeus on Delos, he searched for a place where he could build his shrine. He came across a site that was guarded by a giant python, on what became known as Delphi. Apollo slew the serpent and set up his shrine, which became the oracle of Delphi where messages received by a prophetess known as the Pythoness were thought to be direct messages from the sun-god himself. Two admonitions written on the temple gates read: “Know thyself’ and “Nothing in excess.” According to Guttman and Johnson, the myth and the messages depict Apollo and the Sun as the “reconciler of opposites,” the power of the masculine directive principle to unite with the more mystical feminine principle lying beneath directed consciousness. These two polarities are born out in the activities governed by Apollo requiring focused consciousness: mathematics, science, archery; and those requiring a deeper mystical consciousness—prophecy, dreams, oracles. As god of music and healing, Apollo depicts this ability to create order out of the numinous. Similarly, Shamash is often depicted as rising between two mountains, which to Guttman and Johnson represent the boundaries of the world—the polarities of human consciousness. While one may see in Vettius Valen’s allusions to the Sun as soul, modern concepts inherent in transpersonal psychology, Schmidt states that this particular text “seems to imply that the Sun has this role in the cosmos as a whole, not in the native.” The Hellenistic form of astrology which Valens practiced was rooted in a Neoplatonic conceptualization of the universe as a cosmic animal with intelligence and language. In Plato’s Republic, the highest God was called “the Good” and the Sun was envisioned as its archetype or “the son of the Good.” Therefore the Good was considered a “transmundane sun” who created the world and everything in it through the power of its reason or Logos. In the Gospel of St. John (1:1–2), the Logos is referred to as the divine word: “In the beginning was the Word (Logos) and the Word was with God. According to St. John, the Logos incarnated as Christ who was therefore identified with the spirit of the Sun. It is against this background that early Christians placed the birth of Christ on December 25, which was the date of the pagan festival of Sol Invictus (Invincible Sun) and the date on which the winter solstice was celebrated (when Helios was thought to be reborn as his light increased until the summer solstice). Aveni, Anthony. Stairways to the Stars. New York: John Wiley & Sons, 1997. Lehman, J. Lee. Classical Astrology for Modern Living. Atglen, PA: Whitford Press, 1996. Louis, Anthony. Horary Astrology Plain and Simple. St. Paul, MN: Llewellyn Publications, 1998. Seymour, Percy. Interview in Mountain Astrologer. August/September 1998. Wilson, James. A Complete Dictionary of Astrology. London: W. Hughes, 1819.
a hot plasma sphere that is the central body of the solar system. The sun is the closest star to the earth. The mass of the sun is 1.990 × 1030 kg, which is 332,958 times greater than the mass of the earth. The sun contains 99.866 percent of the mass of the solar system. The solar parallax—that is, the angle subtended at the sun’s center by the earth’s equatorial radius when the earth is at its mean distance from the sun—is equal to 8.794“, or 4.263 × 10–5 radian (rad). The distance of the earth from the sun varies from 1.4710 × 1011 m in January to 1.5210 × 1011 m in July; the mean distance, which is known as the astronomical unit, is 1.4960 × 1011 m. The mean angular diameter of the sun is 1,919.26”, or 9.305 × 10–3 rad. The diameter of the sun is 1.392 × 109 m and is thus 109 times greater than the equatorial diameter of the earth. The mean density of the sun is 1.41 × 103 kg/m3. The gravitational acceleration at the sun’s surface is 273.98 m/sec2, and the escape velocity 6.18 × 105 m/sec. The effective surface temperature of the sun, as calculated in accordance with the Stefan-Boltzmann law from the total energy radiated by the sun, is 5770°K (see). History of telescopic observation. The first telescopic observations of the sun were made by Galileo in 1611. He discovered sunspots and showed that the sun rotates about its axis. In 1843 the German astronomer H. Schwabe discovered the cyclicity of solar activity. The development of methods of spectrum analysis permitted study of the physical conditions on the sun. J. von Fraunhofer’s discovery of dark absorption lines in the solar spectrum in 1814 laid the foundation for study of the chemical composition of the sun. Observations of solar eclipses have been conducted regularly since 1836; results of these observations include the discovery of the solar corona, the solar chromosphere, and solar prominences. In 1913 the American astronomer G. Hale detected the Zeeman splitting of some Fraunhofer lines in sun-spot spectra and thereby demonstrated the existence of magnetic fields on the sun. By 1942, the Swedish astronomer B. Edlén and others had identified several lines of the coronal spectrum as lines of highly ionized elements; evidence was thus provided for a high temperature in the corona. In 1931, B. Lyot invented the corona-graph, which made possible observation of the corona and chromosphere at times other than during solar eclipses. The radio emission of the sun was discovered in the early 1940’s. The development of magnetohydrodynamics and plasma physics in the second half of the 20th century gave a substantial impetus to the development of solar physics. The onset of the space age brought the application of the methods of space astronomy, or extraterrestrial astronomy, to the study of solar radiation in the ultraviolet and X-ray regions of the spectrum. These methods involve the use of rockets, automatic orbiting observatories on artificial earth satellites, and manned space laboratories. In the USSR, solar research is carried on at the Crimean and Pulkovo observatories and at astronomical institutions in Moscow, Kiev, Tashkent, Alma-Ata, Abastumani, and Irkutsk. Most astrophysical observatories outside the USSR engage in solar research (seeASTRONOMICAL OBSERVATORIES AND INSTITUTES). Rotation. The sun rotates about its axis in the same direction as the earth. The solar equator is inclined at 7°15’ to the plane of the ecliptic, that is, the plane of the earth’s orbit. The rotational speed can be determined from the apparent motion of various features of the solar atmosphere and from the shift of the lines of the spectrum of the limb, or edge, of the solar disk owing to the Doppler effect. Through these methods, the sun’s period of rotation was found to be different at different latitudes. The positions of features on the solar surface are determined in terms of heliographic coordinates. The heliographic latitude is measured from the solar equator. The heliographic longitude is measured from the central meridian of the visible solar disk or from some other meridian selected as the prime meridian. It is assumed here that the sun rotates as a solid body. Astronomical yearbooks give the position of the prime meridian for each day. The yearbooks also give the position of the solar axis on the celestial sphere. A point whose heliographic latitude is 17° completes a single rotation, relative to the earth, in 27.275 days; the period of rotation measured in this way is known as the synodic period. The sidereal period of rotation, that is, the period relative to the stars, at the same latitude is 25.38 days. The sidereal angular speed of rotation ω varies with the latitude φ in accordance with the equation (ω = 14.44° – 3°(sin2 φ) per day. The linear speed of rotation at the solar equator is approximately 2,000 m/sec. The sun as a star. The sun is a typical yellow dwarf and lies near the middle of the main sequence of the Hertzsprung-Russell diagram. The apparent photovisual magnitude of the sun is –26.74, and the absolute visual magnitude Mv is +4.83. The color index of the sun for the blue (B) and visual (V) spectral regions is MB – Mv = 0.65. The sun’s spectral type is G2V. The speed of the sun in space relative to the nearest stars is 19.7 × 103 m/sec. The sun is located within one of the spiral arms of the Milky Way Galaxy at a distance of approximately 10 kiloparsecs from the Galaxy’s center. The sun’s period of revolution about the center of the Galaxy is approximately 200 million years. The age of the sun is approximately 5 × 109 years. Internal structure. The internal structure of the sun is determined on the assumption that the sun is a spherically symmetric body and is in equilibrium. A model of the sun’s internal structure can be constructed on the basis of the following: the energy transport equation; the law of conservation of energy; the equation of state of an ideal gas; the Stefan-Boltzmann law; the conditions for hydrostatic, radiative, and convective equilibrium; ob-servationally determined values for the total radiation, total mass, and radius of the sun; and data on the sun’s chemical composition. Hydrogen is presumed to make up about 70 percent of the sun’s mass, and helium about 27 percent; the content of all other elements is presumed to be about 2.5 percent. On the basis of these assumptions, it has been calculated that the temperature at the sun’s center is (10–15) × 106°K, the density is about 1.5 × 105 kg/m3, and the pressure is 3.4 × 1016 newtons per m2(N/m2), or about 3 × 1016 atmospheres. Nuclear reactions in the sun’s interior are presumed to be the energy source that replenishes the energy lost to radiation and maintains the high temperature of the sun. The mean quantity of energy generated within the sun is 1.92 ergs/g/sec. The release of energy is due to nuclear reactions in which hydrogen is converted into helium. Two series of such thermonuclear reactions are possible in the sun: the proton-proton chain, or hydrogen cycle, and the carbon cycle. It is most likely that the proton-proton chain predominates in the sun. This cycle consists of three reactions: (1) nuclei of deuterium, which is a heavy isotope of hydrogen of mass number 2, form from hydrogen nuclei; (2) nuclei of the helium isotope of mass number 3 form from the deuterium nuclei; and (3) nuclei of the stable isotope of helium of mass number 4 form from the light helium nuclei. Energy transport. Energy is transported outward from the inner layers of the sun mainly through the absorption of electromagnetic radiation from lower layers and the subsequent reemission of the radiation. Since the temperature decreases with increasing distance from the center of the sun, the wavelength of the radiation transporting the greater part of the energy to the upper layers gradually increases (seeWIEN’S LAW OF RADIATION). Convective transport of energy—that is, transport through the motion of hot material upward from inner layers and the motion of cooler material toward the center—plays an important role in the relatively high layers forming the convective zone of the sun. This zone begins at a depth of the order of 0.2 solar radius and is about 108 m thick. The speed of the convective motions increases with increasing distance from the center of the sun and in the outer portion of the convective zone reaches 2,000–2,500 m/sec. In even higher layers—that is, in the solar atmosphere—energy is again transported through radiation. Some energy is carried to the upper layers of the solar atmosphere (the chromosphere and corona) by mechanical and magnetohydrodynamic waves that are generated in the convective zone but are absorbed only in these layers. The density of the upper atmosphere is very low, and the required removal of energy by radiation and thermal conduction is possible only if the kinetic temperature of these layers is sufficiently high. Finally, in the upper portion of the corona, most of the energy is carried away by the solar wind, which is an outflow of matter from the sun. The temperature in each layer is at such a level that an energy balance is automatically maintained: the amount of energy acquired owing to absorption of radiation, to thermal conduction, or to convection is equal to the sum of the energy losses of the layer. Total radiation. The total solar radiation can be determined from the irradiance from the sun at the earth’s surface. The average illuminance at the earth’s surface is about 100,000 lux when the sun is at the zenith. Outside the atmosphere, at the earth’s mean distance from the sun, the illuminance is 127,000 lux. The luminous intensity of the sun is 2.84 × 1027 international candles. The important quantity known as the solar constant is the total radiation energy received from the sun per min per cm2 on a surface that is outside the atmosphere at the earth’s mean distance from the sun and is perpendicular to the sun’s rays. The total energy output of the sun is 3.83 × 1026 watts (W), of which about 2 × 1017 W reach the earth. The mean luminance of the solar surface when observed outside the earth’s atmosphere is 1.98 × 109nits (nt), and the luminance of the center of the solar disk is 2.48 × 109 nt. The luminance of the solar disk decreases from the center of the disk to the limb. This decrease depends on the wavelength—for example, the luminance at the limb is about 0.2 of that of the center for light of wavelength 3,600 angstroms (Å) and is about 0.3 of the luminance of the center for light of wavelength 5,000 A. At the very edge of the solar disk, the luminance decreases by a factor of 100 over less than 1 second of arc. For this reason, the boundary of the solar disk appears very sharp. Spectral composition of emitted light. The spectral composition of the light emitted by the sun—that is, the spectral energy distribution—roughly corresponds to the energy distribution in the radiation of a blackbody at a temperature of about 6000°K (after allowance is made for absorption in the earth’s atmosphere and for the Fraunhofer lines). Marked deviations, however, are observed in some parts of the spectrum. The energy maximum in the solar spectrum corresponds to the wavelength 4,600 Å. The solar spectrum is a continuum on which more than 20,000 absorption lines (Fraunhofer lines) are superposed. More than 60 percent of the Fraunhofer lines have been identified as the spectral lines of known chemical elements by comparison of the wavelengths and relative intensities of the Fraunhofer lines with laboratory spectra. Study of the Fraunhofer lines gives information not only on the chemical composition of the solar atmosphere but also on the physical conditions in the layers in which particular lines arise. The predominant element in the sun is hydrogen. The number of hydrogen atoms is four or five times greater than the number of helium atoms and is at least 1,000 times greater than the number of atoms of all the other elements combined. Among these other elements, the most abundant include oxygen, carbon, nitrogen, magnesium, silicon, sulfur, and iron. Lines belonging to some molecules and free radicals, such as OH, NH, CH, and CO, can also be identified in the solar spectrum. Magnetic fields. Magnetic fields on the sun are measured primarily on the basis of the Zeeman splitting of the absorption lines in the solar spectrum (seeZEEMAN EFFECT). Several types of magnetic fields can be distinguished (see). The sun’s general magnetic field is weak; it reaches a strength of 1 oersted for a given polarity and varies with time. This field is closely connected with the interplanetary magnetic field and the interplanetary field’s sectorial structure. The magnetic fields associated with solar activity can reach strengths of several thousand oersteds in sunspots. The structure of the magnetic fields in active regions is very complicated and magnetic poles of opposite polarity alternate. Localized magnetic fields of hundreds of oersteds are also found outside the sunspots. Magnetic fields penetrate into the chromosphere and into the solar corona. Magnetohydrodynamic and plasma processes play an important role on the sun. At temperatures of 5000°-10,000°K, the gas is sufficiently ionized and has a high conductivity; because of the vast scale of solar phenomena, the magnitudes of the electromechanical and magnetomechanical interactions are very large (seeCOSMIC MAGNETOHYDRODYNAMICS). Photosphere. The solar atmosphere consists of the outer, observable layers of the sun. Almost all solar radiation comes from the photosphere, which is the lowest portion of the atmosphere. By making use of the observed radiation flux and the equations for radiative energy transport, radiative equilibrium, and local thermodynamic equilibrium, a theoretical model can be constructed for the distribution of temperature and density with depth in the photosphere. The photosphere is about 300 km thick, and its mean density is 3 × 10–4 kg/m3. The temperature of the photosphere decreases as the distance from the center of the sun increases; the mean temperature is of the order of 6000°K. The temperature is about 4200°K at the top of the photosphere. The pressure in the photosphere varies from 2 × 104 to 102 N/m2. The existence of convection in the zone underlying the photosphere is evidenced by the photosphere’s nonuniform luminance and apparent granular structure, which is known as the photo-spheric granulation. The granules are bright patches of a more or less round shape that are visible in photographs of the sun taken in white light. The granules are 150–1,000 km in diameter and last for 5–10 min, although individual granules have been observed for up to 20 min. Sometimes the granules form clusters up to 30,000 km across. The granules are 20–30 percent brighter than the intergranule “lanes.” This difference corresponds to an average difference in temperature of 300°K. Unlike other formations, the photospheric granulation is the same at all heliographic latitudes and is independent of solar activity. The speeds of the random motions in the photosphere are 1–3 km/sec, according to different determinations. Quasi-periodic radial oscillatory motions have been found in the photosphere. They occur in areas 2,000–3,000 km across and have a period of about 5 min and a velocity amplitude of the order of 500 m/sec. After several periods, the oscillations in a given place die out and may then begin again. Observations have also shown the existence of cells in which motion occurs in a horizontal direction from the center of the cell toward its edges. The speed of the outward flow is about 500 m/sec. The cells, called supergranules, are 30,000–40,000 km across. The supergranules coincide in position with the cells of the chromospheric network. The magnetic field is more intense at the edges of the supergranules. The supergranules presumably reflect the existence of convection cells of the same size at a depth of several thousand kilometers below the surface. The photosphere was originally assumed to produce only a continuous spectrum, with absorption lines being formed in a reversing layer located above the photosphere. It was subsequently found that spectral lines as well as a continuous spectrum are formed in the photosphere. In order, however, to simplify the mathematics involved in calculating the spectral lines, the concept of the reversing layer is still sometimes used. Sunspots and faculae. Sunspots and faculae are often observed in the photosphere. Sunspots are dark formations generally consisting of two parts: a darker core, called the umbra, and a surrounding less dark region, the penumbra. The diameter of a sun-spot may be as great as 200,000 km. Some sunspots are surrounded by a bright border. Very small sunspots are called pores. A sunspot’s lifetime varies from several hours to several months. Even more absorption lines and bands are observed in sunspot spectra than in the spectrum of the photosphere. Sunspot spectra are reminiscent of the spectra of stars of spectral type KO. In what is known as the Evershed effect, the motion of matter in the spots is indicated by Doppler line shifts: gas flows outward from the spot’s center at lower levels and inward at higher levels at speeds reaching 3 × 103 m/sec. Comparison of the intensities of the lines and continuous spectra of sunspots and of the photosphere shows that sunspots have a temperature of 4500°K or less and are 1000°-2000°K cooler than the photosphere. Sunspots consequently appear dark against the background of the photosphere. The luminance of the core of a sunspot is 0.2–0.5 of the luminance of the photosphere, and the luminance of the penumbra is approximately 80 percent of that of the photosphere. All sunspots have a strong magnetic field. Large sunspots may have fields as intense as 5,000 oersteds. Sunspots usually form groups, which, with respect to magnetic field, may be unipolar, bipolar, or multipolar. The multipolar groups contain many sun-spots of different polarities, with the spots often sharing a common penumbra. Sunspot groups are always surrounded by faculae, flocculi, and prominences. Solar flares sometimes occur near sunspot groups, and ray and arch structures are observed in the corona above the groups. All these phenomena collectively form active regions on the sun. The mean annual numbers of observed sunspots and active regions and the mean area occupied by sunspots vary with a period of about 11 years. This period is an average value, and the duration of individual cycles of solar activity varies from 7.5 to 16 years (see). The maximum number of spots simultaneously visible on the surface of the sun is different for different cycles. The maximum in one cycle may be more than twice as great as the maximum in another. Sunspots are generally found in the belts between 5° and 30° heliographic latitude on both sides of the solar equator. The first spots of a cycle occur at high latitudes in these belts, and the last spots appear at low latitudes while spots of the succeeding cycle are appearing at higher latitudes. Bipolar sunspot groups are observed most often. Such groups consist of two large spots, called the leading and following spots, and often of several smaller spots as well. The leading and following spots of a group are of opposite magnetic polarity. In a given cycle, the polarities of the leading spots are all the same in one hemisphere and are opposite in the other hemisphere. Sunspots apparently are depressions in the photosphere. The density of the matter in sunspots is less than the density of the matter in the photosphere at the same level. Faculae are observed in active regions of the sun and are bright photospheric formations visible in white light primarily near the sun’s limb. They usually appear before sunspots and exist for some time after the disappearance of the spots. The area of a fa-cular region is several times greater than the area of the associated group of sunspots. The number of faculae on the solar disk depends on the phase of the solar activity cycle. Faculae have maximum contrast (18 percent) near, but not at, the limb. They are practically invisible in the center of the solar disk, where the contrast is very low. They have a complex, veined structure, and their visibility depends on the wavelength at which observations are conducted. The temperature of faculae is several hundred degrees higher than the temperature of the photosphere. The total radiation from 1 cm2 of a facula is 3–5 percent greater than the figure for the photosphere. Faculae apparently rise somewhat above the photosphere. The lifetime of an average facula is 15 days, but that of individual faculae may reach almost three months. Chromosphere. The layer of the solar atmosphere that is located above the photosphere is called the chromosphere. Unless special telescopes with narrow-band light filters are used, the chromosphere is visible only during total solar eclipses. At such times, it appears as a rosy arc around the dark limb of the moon during the minutes when the moon completely covers the photosphere. The chromospheric spectrum can also be observed during an eclipse. The spectrum so observed is called the flash spectrum. The chromosphere at the sun’s limb appears to the observer as an uneven fringe, from which “spikes,” called spicules, emerge. The spicules vary in diameter from 200 to 2,000 km and reach heights of the order of 10,000 km. The spicule plasma moves upward at speeds as high as 30 km/sec. Up to 250,000 spicules may exist simultaneously on the sun. When observations are performed in monochromatic light, for example, the light of the ionized calcium line at 3,934 A, a bright chromospheric network is visible on the solar disk. This network consists of individual elements. The small elements are 1,000 km in diameter, and the large ones are 2,000–8,000 km in diameter. The large elements are clusters of small elements. The cells of the network are 30,000–40,000 km in diameter. The spicules are presumably formed on the borders of the cells. When observations are made in the light of the red hydrogen line at 6,563 A, a characteristic vortical structure is seen in the chromosphere near sunspots. The density of the matter in the chromosphere decreases with increasing distance from the center of the sun. The number of atoms per cm3 varies from 1015 near the photosphere to 109 in the upper chromosphere. The spectrum of the chromosphere consists of hundreds of emission lines of hydrogen, helium, and metals. The strongest of these spectral lines is the red hydrogen Hα line at 6,563 Å and the H and K. lines of ionized calcium with wavelengths of 3,968 and 3,934 Å. The extent of the chromosphere is different for observations made in different spectral lines. In the strongest chromospheric lines, the chromosphere can be traced out to 14,000 km above the photosphere. Study of chromospheric spectra has led to the conclusion that the temperature is at a minimum in the transition layer between the photosphere and chromosphere, rises to 8000°–10,000°K above the base of the chromosphere, and reaches 15,000°–20,000°K at a height of several thousand km. Turbulent motions of gas have been found to occur in the chromosphere at speeds of up to 15 × 103 m/sec. In the chromosphere, faculae in active regions are visible in the monochromatic light of the strong chromospheric lines as the bright formations usually called flocculi. The dark formations called filaments are easily seen in the Hα line. At the edge of the solar disk, the filaments extend beyond the disk and are observed against the background of the sky as bright prominences. Filaments and prominences are most common in four zones that are symmetrically arranged relative to the solar equator: two polar zones to the north of +40° latitude and to the south of + 40° and two low-latitude zones at about ± 30° at the beginning of a cycle of solar activity and at about ± 17° at the end of a cycle. The filaments and prominences of the low-latitude zones exhibit a pronounced 11-year cycle, and their maximum coincides with the sunspot maximum. For the high-latitude prominences, the dependence on the phases of the solar activity cycle is less marked, and the maximum is reached two years after the sunspot maximum. Filaments that represent quiescent prominences may be as long as one solar radius and may exist for several rotations of the sun. The mean height of prominences above the surface of the sun is 30,000–50,000 km; their average length is 200,000 km, and their average thickness is 5,000 kilometers. A. B. Severnyi has found that prominences can be divided into three groups according to the character of the motion involved: electromagnetic prominences, in which motions occur along orderly curved trajectories that are lines of force of the magnetic field; random prominences, in which disorderly, turbulent motions predominate (with speeds of the order of 10 km/sec); and eruptive prominences, in which the material of an initially quiescent prominence with random motions is suddenly thrown out away from the sun at an increasing speed that reaches 700 km/sec. The temperature in prominences or filaments is 5000°-10,000°K; the density is close to the mean density of the chromosphere. Filaments that are active, rapidly changing prominences usually undergo marked alteration over a few hours or even minutes. The form and character of the motions in prominences are closely connected with the magnetic field in the chromosphere and corona. Corona. The corona is the outermost and most tenuous part of the solar atmosphere and extends more than ten solar radii. The corona can be observed during total solar eclipses, when it appears as a pearly white glow about the solar disk covered by the moon. The structural features of the corona stand out clearly; they include helmet streamers, plumes, rays, and polar brushes. Only with the invention of the coronagraph in 1931 did it become possible to observe the corona at times other than during eclipses. The general shape of the corona varies with the phase of the solar activity cycle: during years of minimum activity, the corona is markedly drawn out along the equator; in years of maximum activity, the corona is almost spherical. In white light, the surface brightness of the solar corona is a million times less than the brightness of the center of the solar disk. The light of the corona results mainly from the scattering of photospheric light by free electrons. Practically all the atoms in the corona are ionized. The density of the ions and free electrons at the base of the corona is 109 particles per cm3. The corona is heated in much the same way as the chromosphere. The greatest release of energy occurs in the lower portion of the corona. As a result, however, of the high thermal conductivity, the corona is almost isothermal, and the temperature decreases very slowly with increasing height. Energy is carried out of the corona in several ways. In the lower portion of the corona, the transport of energy downward through thermal conduction plays the principal role. The escape of the most rapid particles from the corona leads to a loss of energy. In the outer portions of the corona, much energy is carried away by the solar wind, which is an outflow of coronal gas. The speed of the solar wind increases with increasing distance from the sun: the speed is several km/sec at the surface of the sun and 450 km/sec at the distance of the earth. The temperature of the corona exceeds 106°K. In active regions, the temperature is even higher and may reach 107°K. Coronal condensations, in which the particle density is increased by a factor of several tens, may form above active regions. Part of the radiation of the inner corona is composed of emission lines of multiply ionized atoms of iron, calcium, magnesium, carbon, oxygen, sulfur, and other chemical elements. These lines are seen in both the visible and ultraviolet regions of the spectrum. The radio emission of the sun in the meter band and solar X-ray emission originate in the corona. These emissions are enhanced severalfold in active regions. Calculations have shown that the corona is not in equilibrium with the interplanetary medium. The particle fluxes forming the solar wind stream out from the corona into interplanetary space. A relatively thin transition layer exists between the chromosphere and corona. In this layer, the temperature rises sharply to the values characteristic of the corona. The conditions in the layer are determined by the energy flux from the corona as a result of thermal conduction. The transition layer is the source of most of the sun’s ultraviolet radiation. The chromosphere, transition layer, and corona produce all the observed radio emission of the sun. In active regions, the structure of the chromosphere, corona, and transition layer is altered. This alteration, however, has not yet been sufficiently studied. Flares. In active regions of the chromosphere, sudden and relatively short-lived increases in brightness are observed that are visible simultaneously in many spectral lines. These bright formations may last for several minutes to several hours and are called flares. They are best observed in the light of the Hα hydrogen line. The brightest flares, however, are sometimes visible even in white light. The spectrum of a flare has several hundred emission lines of various elements, both neutral and ionized. The temperature of the layers of the solar atmosphere that produce light in the chro-mospheric lines is (1–2) × 104°K; in higher layers, the temperature reaches 107°K. The particle density in a flare reaches 10l3–1014 per cm3. The area covered by a flare may be as great as 1015 m2. Flares usually occur near rapidly developing groups of sunspots with magnetic fields of complex configuration. The occurrence of flares is accompanied by the activation of filaments and flocculi and by the ejection of material. The amount of energy released in a flare is very large and may reach 1024–1025joules. The energy of a flare is presumably initially stored in the magnetic field and then rapidly released. The energy release leads to localized heating and the acceleration of protons and electrons. These accelerated particles cause further heating of the gas, emission by the gas in various regions of the electromagnetic spectrum, and the formation of a shock wave. Flares produce a considerable increase in the ultraviolet emission of the sun and are accompanied by bursts of X rays (sometimes very intense), by radio bursts, and by the ejection of particles with energies of up to 10’° electron volts. Bursts of X rays are sometimes observed without increased brightness in the chromosphere. Some flares, called proton flares, are accompanied by especially intense fluxes of energetic particles (solar cosmic rays). Proton flares pose a danger for astronauts because when the energetic particles collide with the atoms in the hull of a spaceship, bremsstrahlung, X rays, and gamma radiation are produced, sometimes in dangerous amounts. Effect of solar activity on terrestrial phenomena. The sun is ultimately the source of all forms of energy used by mankind, except atomic energy. These forms include wind energy, the energy of falling water, and the energy released in the combustion of all types of fuel. Solar activity influences processes occurring in the atmosphere, magnetosphere, and biosphere of the earth in many ways (see). Solar instruments. Observations of the sun are conducted by means of small-and medium-sized refracting telescopes and large reflecting telescopes. In these instruments, most of the optical components are fixed; the solar rays are directed into the horizontally or vertically positioned fixed telescope by means of one (in a siderostat or heliostat) or two (in a coelostat) moving mirrors. In the construction of large solar telescopes, special attention is devoted to high resolution with respect to the solar disk. The coronagraph is a special type of solar telescope. The image of the sun is eclipsed within a coronagraph by an artificial “moon,” which is a special opaque disk. In a coronagraph, the amount of scattered light is reduced manyfold, and the outermost layers of the solar atmosphere can therefore be observed at times other than during eclipses. Solar telescopes are often provided with narrow-band light filters that permit observation in the light of a single spectral line. Neutral filters have also been developed with radially variable transmittance; such filters permit observation of the solar corona at a distance of several solar radii. The larger solar telescopes are usually equipped with large spectrographs with photographic or photoelectric recording of spectra. The spectrograph may also have a magnetograph, which permits study of the Zeeman splitting and polarization of spectral lines and makes possible determination of the magnitudes and directions of the magnetic fields on the sun. In order to eliminate the blurring effect of the earth’s atmosphere and to investigate solar radiation in such spectral regions as the ultraviolet and infrared, which are absorbed in the earth’s atmosphere, orbiting observatories located outside the atmosphere have been developed. They permit spectra of the sun and of individual formations on its surface to be recorded beyond the earth’s atmosphere. Severnyi, A. B. Fizika Solntsa. Moscow, 1956. Allen, C. W. Astrophysical Quantities. 3rd ed. London, 1973. What does it mean when you dream about the Sun? The sun shining upon the dreamer indicates good fortune or goodwill. The sun is also energy, especially the life energy that gives one health and makes crops grow. Alternatively, excessive sunlight dries up and kills, as symbolized by animal skulls in the desert. The star about which the earth revolves; it is a globe of gas 8.65 × 105 miles (1.392 × 106 kilometers) in diameter, held together by its own gravity; thermonuclear reactions take place in the deep interior of the sun converting hydrogen into helium releasing energy which streams out. Also known as Sol. (Sun Microsystems, Inc., Santa Clara, CA, www.sun.com) A major manufacturer of Unix-based workstations and servers. In 2010, Sun was acquired by Oracle. It all began in 1981 when Bavarian-born Andreas Bechtolsheim was licensing rights to a computer he designed. Named Sun for Stanford University Network and using off-the-shelf parts, it was an affordable workstation for engineers and scientists. In that year, he met Vinod Khosla, a native of India, who convinced him to form a company and expand. Khosla, Bechtolsheim and Scott McNealy, all Stanford MBAs, founded Sun in 1982. Its first computers, the Sun-1 and subsequent Sun-2 were instant successes in the university market. Sun began to compete against its rival Apollo Computer, an east-coast workstation company, eventually surpassing it in sales (Apollo was later purchased by HP). Sun has been a major force in open systems. Its computers have always run under Unix, which was licensed from AT&T and then later purchased outright. Sun and AT&T had formed such a tight alliance for a while that a host of Unix vendors formed the Open Software Foundation (OSF) in 1988 to keep Sun from dominating Unix. In 1984, Bill Joy, head of R&D, designed NFS, which was broadly licensed and became the industry standard for file sharing. Sun later packaged its Unix components into a complete environment named Solaris, which it later ported to other platforms, including the Intel x86. Sun used the Motorola 68K CPUs in its products until it designed its own RISC-based SPARC chips, which it launched with the SPARCstation 1 in 1989. Having gone through many iterations, SPARC CPUs are also made by Fujitsu and other third parties via licensing arrangements (see SPARC). In the mid-1990s, Sun introduced the Java programming language and ushered in a new era for application development on the Internet (see Java and Java EE). See network computer and Sun-Netscape Alliance. The sun sustains all life on Earth. When you see it in your dreams, it suggests that you are being nurtured and sustained by your environment and your life choices. It could also represent a spiritual force or the light of God. Sunrise may indicate new beginnings and a new wave of energy, while sunsets suggest a period of closure and completion. Sunlight in your dreams is never a negative symbol. Light always symbolizes or indicates consciousness and may connote masculine energy. Its presence, even in the most disturbing dreams, has a reassuring quality. Old dream interpretation books say that sun shining on you is an omen of good fortune and good will.